Panna Cotta is one of my favorite desserts. The reason is very simple: it’s very easy to make, you can prepare it a day in advance, and you will always get it right. I’m typically not a big dessert fan, but I will always prepare some dessert for our guests. This time, I was looking to add some special flavors to my classic Panna Cotta recipe, which I often make. For the Thyme Panna Cotta, soak the gelatin sheets in a bowl with cold water. 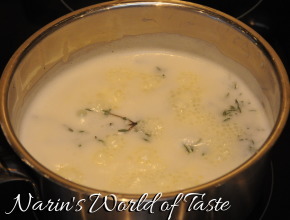 Combine the cream, xylitol or sugar, and thyme in a pot and bring to a simmer. Simmer it for about 5 minutes and remove it from the stove. Squeeze out the water from the gelatin sheets and add them to the pot. Stir until the gelatin has dissolved. Strain the mixture through a sieve and let it cool down for about 10-15 minutes. Stir in the yoghurt and carefully pour the mixture into 6 to 8 dessert glasses. Place them in the fridge for at least 5 hours or until completely set – overnight is ideal. To make the Herbed Honey, simply combine all the ingredients in a blender and blend until smooth. Pour the honey into a jar or tupperware and refrigerate until you serve the dessert. You can prepare this step even a few days in advance. 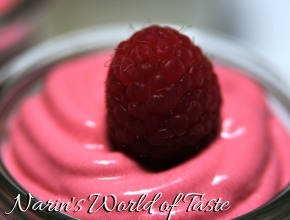 For the Raspberry Espuma, heat the cream and pour it over the frozen berries. Add honey if you like more sweetness, but in my opinion it is not necessary. 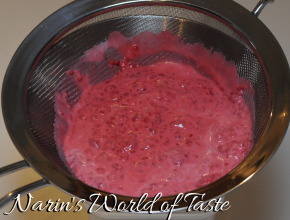 Pass it through a sieve using a spoon (the seeds of the berries should stay behind) and pour the mixture into a cream whipper. It has to refrigerate at least for an hour before you can use it. In case you don’t have a cream whipper available, you can try adding a little whipping cream, and stir vigorously or use a hand blender to obtain a fluffy texture. 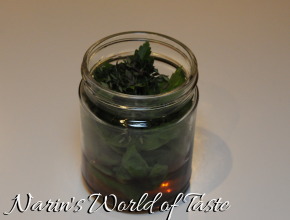 To serve, pour 2 tbsp of the Herbed Honey over the Thyme Panna Cotta. 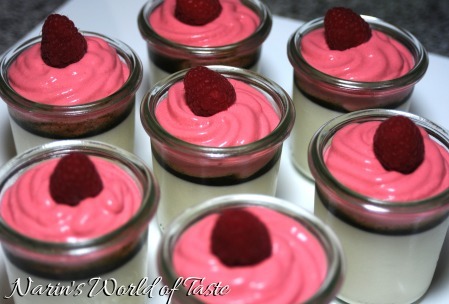 Shake the whipping cream dispenser and release a good portion of raspberry foam on top of each dessert. Decorate it with a fresh raspberry and serve immediately.